Discussion in '9/11' started by Whitebeard, Jan 19, 2017. One of the main arguments 9-11 truthers use as 'proof' of controlled demolition is the alleged 'fact' that 'fire has never caused a tall building to collapse before or since', often going on to quote more recent incidents such as the Marina Torch and The Address fires in Dubai. So do tall building collapse when burning for several hours? The answer is rarely, but yes. This vid is shot from the east of the building, given that all reports say it was the north side of the tower that failed first. Note that from around the 20 second mark there are sounds of loud 'cracks', at 33 seconds you see a large plume of flame below the point where the north wall begins to sag, then at 37 seconds the wall begins to fall down starting at a point 2 floors above where the plume was. 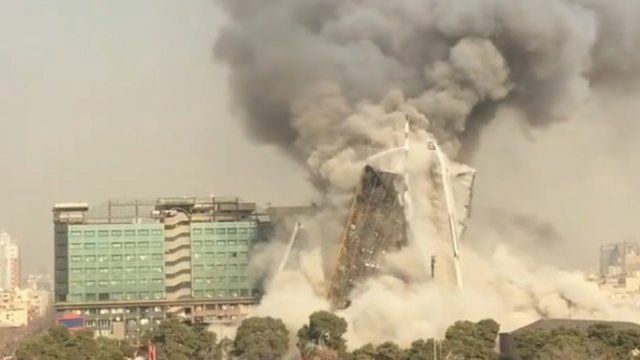 By 42 seconds the wall is in 'free fall' and appears to be pulling the rest of the structure down with it, by 44 seconds all the upper floors are falling and the floors below are failing as they are hit by the upper floors. What appears to be the central core holds on for another second or so before all dropping and by 51 seconds the whole structure is down. It would be interesting to see if the exists any videos of the south aspect of the building, I suspect it would look very similar to the famous footage of the WTC7 collapse. Here's a picture of the building during construction. Looks like a fairly standard steel framed building. The end result was somewhat similar. WTC7 is the most obvious comparison, but aspects of the collapse also match the WTC1/2 collapses, like the "squibs" - supposedly explosions, but actually air and debris being forced out by collapsing floors below the actual line of collapse. The building collapses into its footprint. 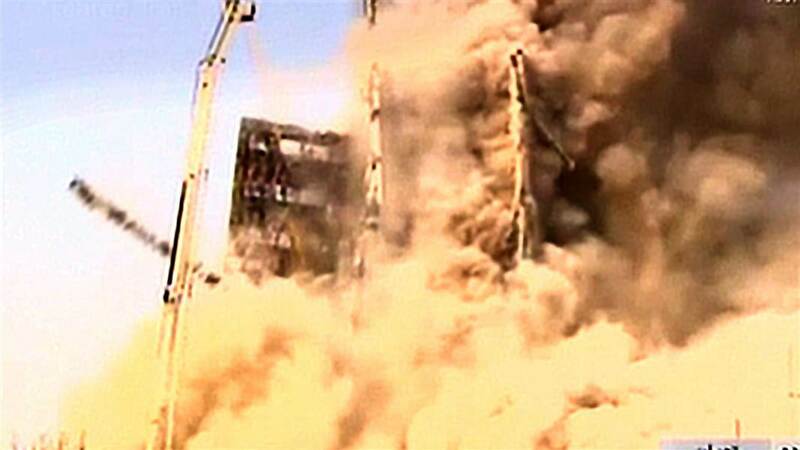 Did the Plasco Buildings parapet free-fall like WTC7's parapet did for 2.3 seconds? There was probably a better firefighting effort made in the Plasco Building than WTC7. Most of the response team was either working at ground zero on WTC 1 and 2, or unfortunately inside the towers. Either way, they were unable probably unable to stagethe type of effort needed to truly fight the fires in Building 7 the way that they would have if it HAD been a normal fire. 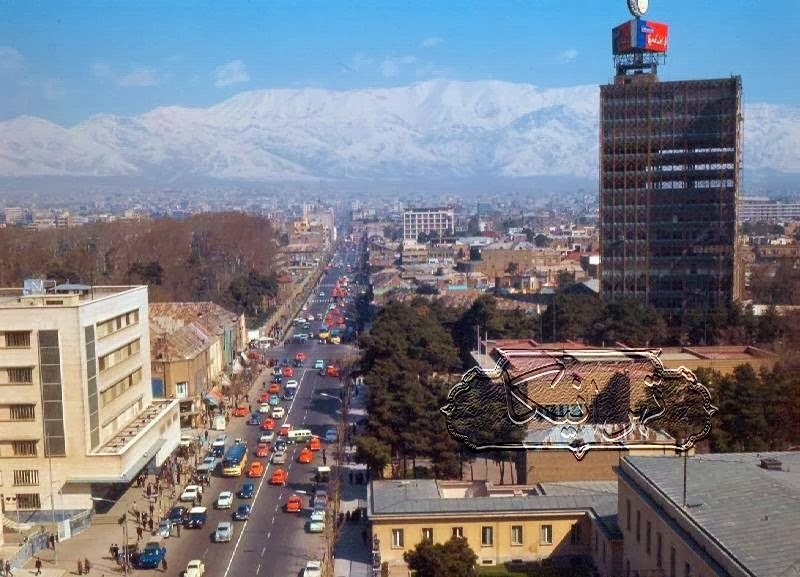 In Tehran, they weren't busy with two other horrible disasters and could send all that they had to handle the blaze and it still came down. I can't seem to find any info on how long the building burned for. Most of the links to the story had the start time around * am local time but no collapse time. WTC 7 burned relatively un-fought for almost 7 hours. Looking at the side-by-side images that Mick posted, I would say that they look Eerily similar, not just somewhat similar. Obviously I picked those because they showed the same thing - a connected but somewhat crumpled section of the exterior wall that was laying on a pile of debris. There's some selection bias there, however when saw that Plasco image it strong reminded me of the few WTC7 images that were similar. I think it does indicate some similarity in the mode of collapse, in that the interior floors were stripped from the walls, which then buckled. WTC1/2 also had floor stripping, but the much higher and larger collapse mean there were no sections like this that survived intact - although a few can be seen falling. I remember the 1988 "First Interstate" fire. I watched it from my window, as I was living in downtown LA at the time. Five floors burned in the 62 story Los Angeles building that was undergoing an incompleted fire-sprinkler system upgrade. The fire Chief (or incident commander) almost pulled his crews due to worries of possible collapse, but the fire was doused before pulling firefighter teams. Later analysis by NIST and FEMA revealed that what saved the building from fire-collapse....was that the structure had an "exceptionally good" applied fire retardant, to the steel beams. In spite of the total burnout of four and a half floors, there was no damage to the main structural members and only minor damage to one secondary beam and a small number of floor pans. Although there was concern for structural integrity during the incident, post fire analysis indicates that there was no danger of major or minor structural collapse. It was noted that quality control in the application of the sprayed-on fire protection was unusually good. It only takes a few minutes for unprotected steel to be compromised. Building collapse is generally going to need a fire that spreads a bt though, to make multiple connections fail. High rise buildings are a 20th and 21st century invention. As with any new invention, problems are forecast, but the real lessons are sometimes learned 'the hard way'. Fire is one lesson better understood after some unfortunate experiences. That being said, I think we'll see "less" structural steel-beamed collapses due to fire (as newer construction continues), because of the previously mentioned "lessons learned".....and that protective measures are being utilized as fire damage is better understood. Then there's this, looks like a postcard of a painted version of a photo. Caption "Ferdowsi, Solar 1341 (1962) - Picture Postcards"
Hard to make out what the interior column configuration is. Bottom right hand side of the building. Do you see the damage to the structure at the lower RHS ? Yes. And Thank you ! There does appear to be damage there and what looks like water on the ground - there has possibly been a hose laid out? 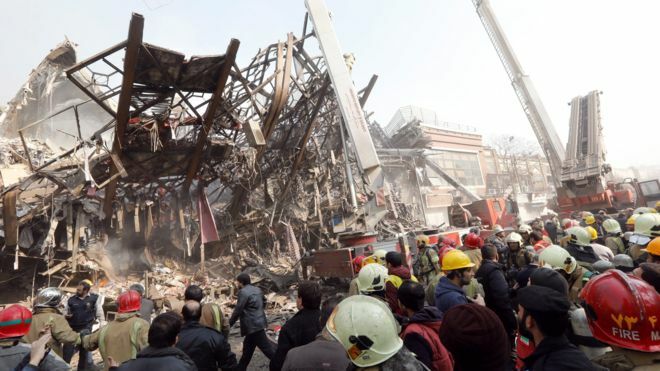 Mehdi Chamran, the president of the city council in Tehran, said the day after the collapse of the Plasco building: "At first, the fire had been mastered, but at around 11:30 am three explosions on upper floors caused 'Collapse of several floors. In this building, there was no urban gas and the heating system operated with fuel oil. The flames melted the metal structure of the building and eventually the whole building collapsed under the weight of the rubble of the upper floors. " Interesting. It seems possible that fuel oil tanks could have exploded and initiated the floor collapses (though this doesn't help AE911Truth at all in their claims that the collapse sequence that followed looked like a controlled demolition), but I'm not sure the audio record we have evidences such explosions just prior to the onset. The only stand-out, sharply distinct sounds I hear across the recordings are consistent with the sound of floors crashing down though out, and I don't hear any such sounds preceding the start of the observable floor collapses (as evidenced by distortions to the building's face and dust expulsions). It also seems odd to me that any initial explosion event would involve three distinct explosions unless there were three separate fuel tanks right next to each other, which would seem odd as well, though perhaps it was the case that additional tanks had been added to a storage location over the years. I'd say we'd need to wait for more details before determining whether the fuel tank explosion initiated collapse theory was based on evidence or whether it was just an early form of CYA from a fire department that, in retrospect, should not have staged its personnel in the building. In any case, this is really feeling like a "jumped the shark moment" for AE911Truth. 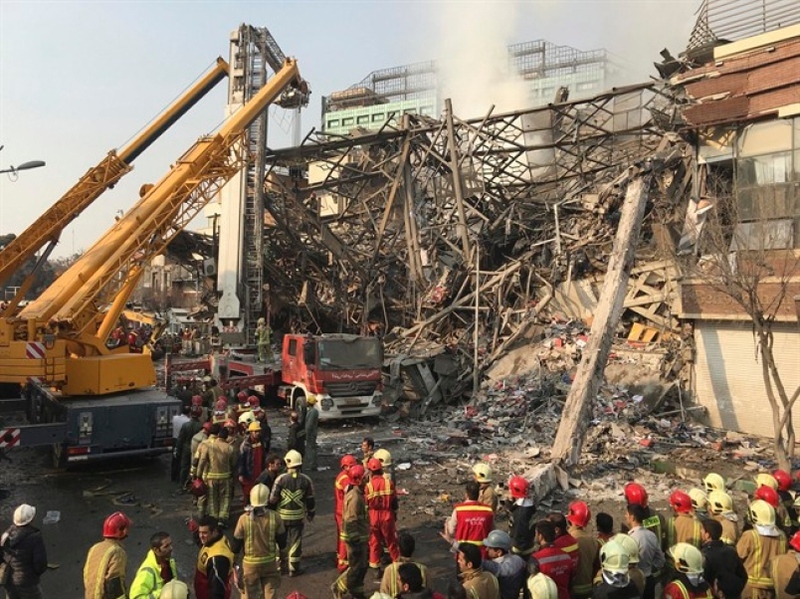 A single positive point in the tragedy is that the building collapsed vertically, rather than horizontally, so that other neighboring structures were not damaged. Most of the 4000 workers had already evacuated the high-rise when it was shaken by several severe explosions, ending in its collapse. Authorities believe gas tanks and other heat sources were the main cause of the explosions. 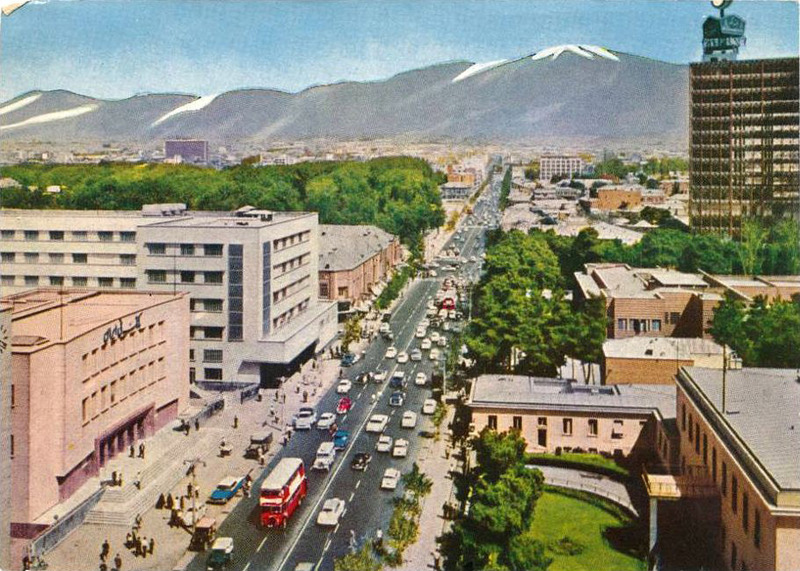 Unlike most Tehran buildings, Plasco was not heated by piped-in natural gas. Meanwhile, the operation of removing rubble is ongoing. Efforts were slowed by the heat of the rubble, which a day after the tragedy averaged between 200 and 600 degrees Celsius (392 and 1112 degrees Fahrenheit). 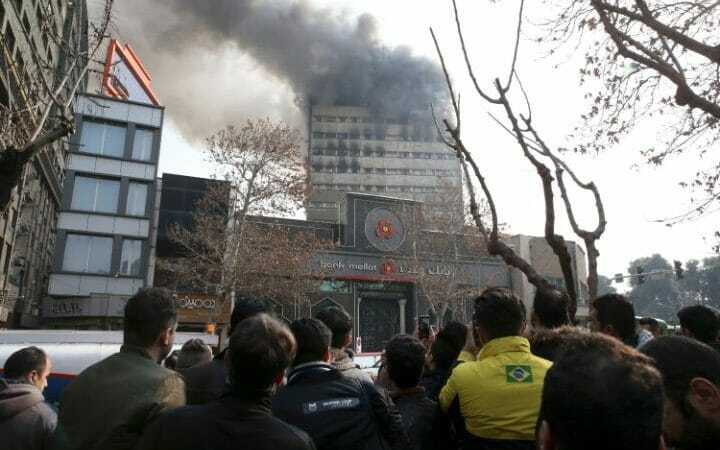 On Friday, regarding details of the fire in Plasco building Mehdi Chamran, head of Tehran’s city council said: “Fire was extinguished but around 11:30 three consecutive explosions caused the upper floors to collapse, this building did not have gas but was using diesel for heating. And the flames resulted in heating up all columns of the building. When upper floors collapsed, a strong strike hits lower floors and all rubbles came down on it. Note that seems to be just a different translation of Chamran's statement. However, to extend the fact that fires do not normally reach the melting point of steel to mean that steel structures cannot be damaged enough by fire to cause collapse fails in the face of the evidence to the contrary and ignores the science of fire engineering just as badly as does saying it melts steel. In French it was "Les flammes ont fait fondre la structure métallique". Lots of people use the term "melt" to simply refer to the softening or weakening of a substance. If shown a picture of a steel beam that has sagged from a heat of a fire, then many people will say that the fire melted the steel. It's just a vernacular usage. And please avoid use of terms like "stupid" or "lie". Be specific about what you think is incorrect. Mehdi Chamran (Persian: مهدی چمران‎‎) is the chair of Islamic City Council of Tehran. He holds a master's degree in architecture from University of Tehran. The key word there being "مذاب" = melt. So this is yet another thing that will force the truthers to either double down, or accept that some of their "evidence" isn't what they they thought it was. I have said before that reports of molten steel in any fire can be either true or untrue. There are numerous examples of reports of molten steel in numerous fires. If these reports are true, it is not unusual for steel to melt in severe fires.. If they are untrue it simply underlibes the frequency of such erroneous reports. The pictures of very hot glowing metal is a likely source for such an error. Plasco building consists of 17 floors (one underground floor, a ground floor and 15 floors on the pilot) and its structure was a steel structure. The source for this would be this article. 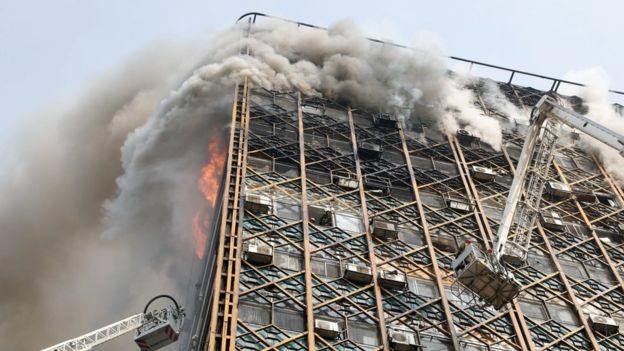 The world economy, Plasco 17-storey building (with a basement floor, a ground floor and 15 floors on the pilot), according to the Tehran municipality, to the sale of clothing in 5 floors as well as clothing production units on the upper floors had become at least 10 times over the past two years written notice from the fire department and municipality for "the incapacity of the fire safety for fire safety certificate" was issued to owners and operators of these structures. Google Translate struggles ^^ But I discern that the building was already on notice as not conforming to fire safety code. There had been a progressive floor collapse in the north-east corner from at least the 10th floor down. Here is a news flash on Mizan and its Google translation - note the date and local time: 11:21 on the day of the event (Jan 19), about 10 minutes prior to total collapse. Multimedia news agency reported amount, in the absence of a fire extinguishing completed and seeks relief to people who, once again flared up fire from the eastern part of the building. 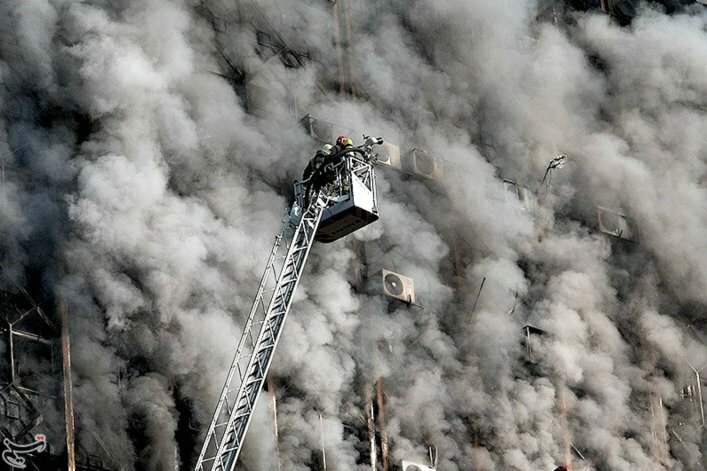 In this regard, Seyyed Jalal Maleki, a fire department spokesman said Plasco was collapsed part of the building. Plasco's north wall of the building completely collapsed and is extremely insecure. A number of forces are now in stories of Plasco caught fire and some remain under the rubble of collapsed buildings. Make sure you watch the video in that article. It shows this partial progressive collapse. Well, that explains the loss of the canopy and collapse of the car park. Right? This photo from a few seconds into the collapse is interesting as it shows the deformation of the building's skin - especially visible on the right, in the area clear of smoke.